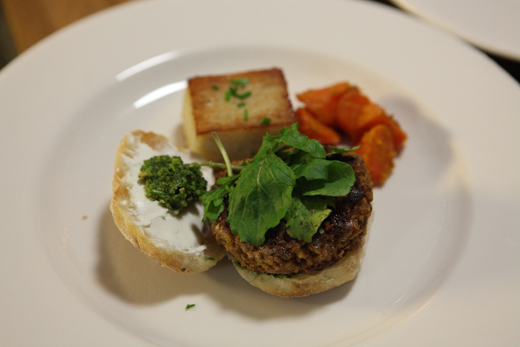 Last weekend I had the extreme pleasure of being asked to prepare a veggie burger for December’s Brooklyn Table dinner. I’d attended several of these dinners over the past year or so and have been repeatedly amazed by Paul, Nicole, and Anna’s culinary skill, dedication, creativity, and finesse. 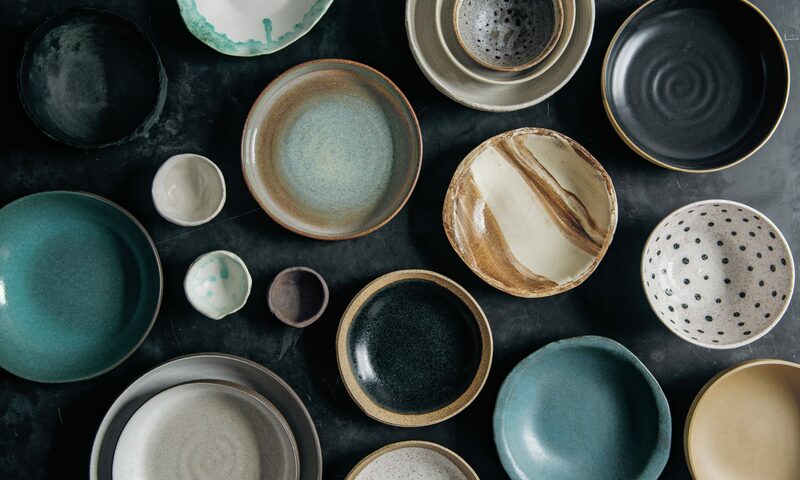 They cook scrumptious (and labor-intensive) 8-course meals in their Brooklyn apartments, and then serve them to two back-to-back groups of a dozen or so people! That is not easy. In gearing up for this latest one, Nicole came to me with the vegetarian headcount and asked if I’d be interested in making a veggie burger. We decided on one of my favorites, the Cashew-Leek Burger from the book. But I wanted to enrich it a bit for the special occasion. It was on the Americas Test Kitchen’s subscriber-only website where I first got the idea to combine bulgur and lentils in a veggie burger. As with everything they do, this is one of those innovations that after the fact seems like it should have been obvious to me, but of course I’d not have thought of it on my own. Lentils and bulgur join forces to create a meat-like texture that’s pretty tasty, and not so bad on the nutritional front. Their combination of cashew and leek, too, is subtle but pleasant, so in my version I wanted to amp up this flavor profile. In revisiting the recipe—and in enrichening it—I did a couple things differently. First of all, I substituted butter for half of the oil, an easy step. Secondly, I added a generous dose of cream cheese, which gives the burgers a creamier mouth-feel and a jolt of, yes, richness. The mixture also needed a bit of Dijon mustard to level out the tang that the cream cheese canceled out in the tomato paste. For condiments, I made an arugula-cashew pesto and put a pile of fresh arugula on the bun, for peppery sting and some raw freshness, and then a thin spread of creamy goat cheese on the bun. And I certainly couldn’t have served these things on a standard hamburger roll. I used Pugliese Rolls from Il Forno Bakery in New York, which reminded me of the breads at my very favorite bakery here, Sullivan Street Bakery—whose “no rise” Italian breads are characterized by a crisp, brittle crust and a very moist, but structured interior. One last note before I get to the recipe, though: I want to apologize for being so neglectful of this website. For the past several months I’ve been in my kitchen and at my laptop working on my next book, which will be out next summer. It’s called Vegetarian Entrees that Won’t Leave You Hungry: Nourishing, Flavorful Main-Course Dishes that Fill the Center of the Plate and I’m very, very excited about it. In my day-to-day veggie excursions I’ve always had a hard time trying to come up with that center-of-the-plate dish (hence the veggie burger’s gravitational pull). I’ve had so many dinners of “a big salad,” or little piles of different side dishes, or bread and cheese, and in my conversations with veggie burger fans over the past year, I’ve found this to be a shared experience, even for those who have been on strict vegetarian and vegan diets for upwards of 20 years. I’ve got lots of exciting recipes and tips so share, so with this news, I’m also pleased to announce “Veggie Burger Madness” will be evolving over the coming months. There will soon be more than just veggie burgers! And now to the recipes . . .
1. In a small saucepan, cover the lentils with 1 cup water, bring the water to boil, then simmer until the lentils are tender and falling apart, about 20 minutes. Drain off excess water if necessary. Set aside to cool. 2. Meanwhile, cover the bulgur with 2 cups boiling water and let stand for 15 to 20 minutes, until tender. If they are still crunchy after 20 minutes, add more boiling water and let stand. Drain off excess water and place with the lentils to cool. 4. In sauté pan, heat 1 tablespoon oil and 1 tablespoon butter over medium heat. When foaming subsides, add the mushrooms and cook until they release their moisture and then the liquid cooks off. Remove from the pan and set aside in a large mixing bowl. 5. Wipe out sauté pan that had been used for the mushrooms. Add 1 tablespoon oil and remaining butter. When foaming subsides, add the leeks and the thyme. Cook until tender and beginning to caramelize, 12 to 15 minutes. Stir in the garlic and tomato paste and cook for 1 to 2 minutes longer, until fragrant. 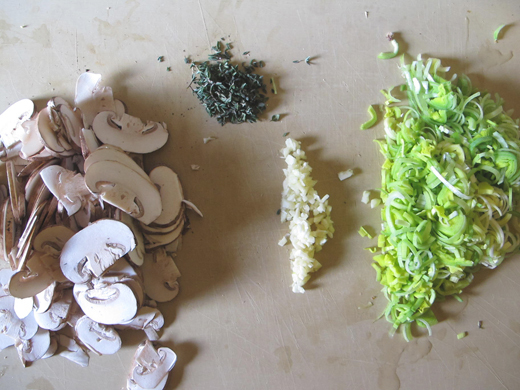 Add the leeks to the mushrooms. 6. In the bowl of a food processor, pulse the cashews, eggs, cream cheese, Dijon, salt, and pepper until combined. Add the mushrooms and leeks and half the lentils and bulgur and pulse until roughly combined. Return this mixture to the mixing bowl the mushrooms had been in and stir in the remaining lentils and bulgur. Work in the breadcrumbs with a spatula or your hands, until it just holds its shape. Shape the mixture into 6 patties. 7. In a large oven-safe skillet or sauté pan, heat the remaining 2 tablespoons oil over medium-high heat. Cook until browned on the bottom, and then flip to brown the other side, about 3 minutes per side. Transfer the pan to the oven and bake for 12 to 15 minutes, until the burgers are firm and cooked through. 1. 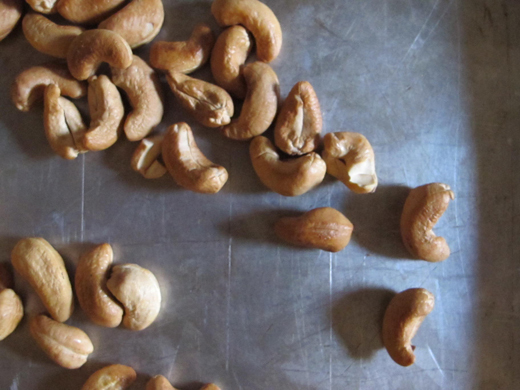 Combine cashews, garlic, vinegar, and salt in food processor, and pulse until ground. Add the arugula and then, with the motor running, slowly pour in the oil. Scrape down the sides of the bowl periodically and continue to process until desired consistency is reached. Season with pepper and additional salt as needed. These sound fabulous! I’d love to try a vegan version of this burger and I’m looking forward to using my fresh garden arugula for your pesto. Good luck with your new book! Thanks, Gina! This would be an easy one to adapt, with Tofutti cream cheese and egg replacer (or even some mashed up potato…), don’t you think? Yes, an adaption would be easy, perhaps using a flax seed mixture for the egg seeings I bought a case of ground flax seed! I like your mashed potato idea too. Wonderful veggie burger. I prepared it yesterday and had it for dinner and today for lunch. I got so carried away making sure I was following the recipe correctly that I forgot I had cashews toasting in the oven. Oops. I spent the next hour scraping away the blackened side because I was out of cashews and there was no way I was not going without this burger. It all worked out. Brilliant recipe. Complex flavors. Filling and so very satisfying. And the arugula pesto is genius! It was like magic watching the arugula, nuts and vinegar forming a deep green paste in just seconds as I poured the olive oil into the food processor. One question: where does the cream cheese come in? It’s listed in the ingredients but not in the directions. I took a guess and figured it belonged in the food processor with the cashews, eggs, and dijon. Oops!! You did it right–in the processor with the eggs. (The recipe is fixed now.) And I’m glad you enjoyed them! I’ve made this one (from the book) a few times. I love it, and so does anyone I serve it to. Everyone says I make the best veggie burgers they’ve every had! (All from your book) I look forward to trying this variation. Thanks for your great recipes. 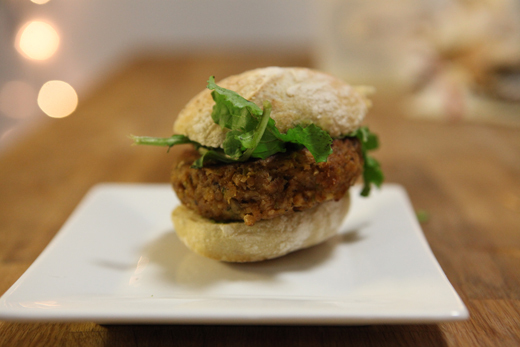 Lukas, I find perfecting these cashew veggie burgers to be just as challenging as cooking multicourse meals! Endless fun. I used butter in the saute steps with delicious results. What I love about your recipes is that every carefully executed step of the prep and each ingredient’s essential flavor can be tasted in the final results. Aloha from rural Kona, Hawaii. And kudos on the newer “entrees” book, besides. I’m enjoying it. Aloha, and thank you! Glad to hear you’re enjoying the recipes. This is the first recipe I have made from your cookbook, and it is delicious! It isn’t a quick meal, but well worth the effort. The burger held together perfectly, and it was so hearty! I look forward to making many more wonderful meals from this cookbook and your next. Thanks! I’m so glad to hear–thank you! Hi Sue, I’m delighted to hear about this and I imagine it will probably be fine, but I’ll need to put you in touch with the publisher—they control rights for this kind of thing. Would you mind sending me an email to veggieburgermadness@gmail.com, and I’ll forward it to them? Sue, I didn’t receive it. Just wanted to let you know so that we don’t hold up your cookbook! Resent. Thanks for letting me know! Hi Lukas, just checking whether you got my email? If not, maybe you could try dropping me a line suesteel385@gmail.com and I’ll reply. Success. Your publisher contacted me and granted permission. 🙂 I’m very grateful for the cooperation of all concerned. 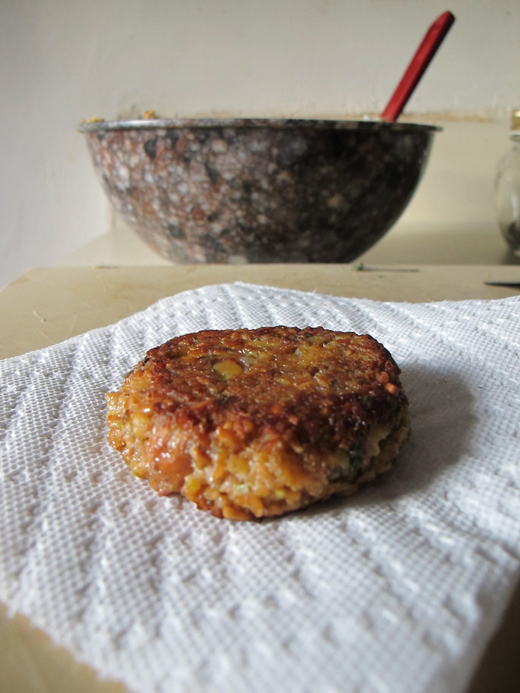 To end on-topic, I thought I’d let you know I made this revised cashew burger today. It took me hours!! It’s a good thing you have a knack for making cooking so darn interesting. 😉 Substituted a yukon gold potato+starch for the eggs, as per your instructions, and took it easy on the bread crumbs so as not to lend an unfortunate cardboard-like finish to the whole thing (which was my mistake with the original version) and LOVED IT. The arugula pesto is even better than it sounds. I’ve learned a lot from your discriminating tastes and impeccable methods. Thank you, Lukas! Picking up your second book now.